Heading to the theatre at Christmas can be a tradition for some families and a daunting experience for others. We absolutely adore the theatre, we go and see everything from musicals to plays and comedies. And with Max going to Stagewise weekly, we are definitely a theatre family. Speaking with lots of parents, I know that many are put off the idea of going to the theatre with their kids due to reasons such as behaviour, costs and for some it's just a new experience that they are unsure of. 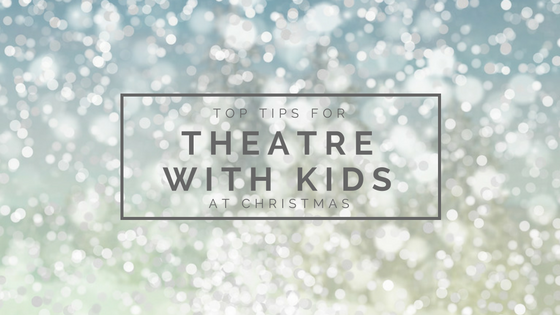 Whilst some parents are unsure, I think that Christmas is the perfect time to introduce your children to the theatre, and I've got a few top tips to make the experience as great as possible. Do some research beforehand. We have theatres like Lighthouse, Poole that we adore and know is completely family friendly. But if we are heading anywhere new then we like to do our research. We make sure that the place is accessible and that the shows are suitable for all ages. We like to check out parking nearby as most theatres don't have onsite parking. We also try and seat ourselves near an aisle or with easy access to toilets! Find family friendly shows. Most theatres put on pantomimes which are fantastic for all the family, but these can be quite long for little ones. Some theatres like to put on additional christmas shows that are better for younger children. These tend to be shorter in length (think 45 minutes with no interval vs 2 hours) which normally keeps their attention. We also like to look out for shows that are based on books that we love, for example Nuffield Theatre, Southampton are putting on Fantastic Mr Fox this Christmas. Let them join in with the celebrations. Many family friendly shows encourage audience participation so we don't stop Max from joining in. It can be something like a traditional "He's behind you!" or can involve children helping the characters move the story forward. Last year we saw Otto and the Robin at the Lighthouse, Poole and Max helped the characters hang up bunting and get the party started. Of course there may be times where children are required to sit down, but if they do need to move around then let them. Take some treats for them. We like to make a small treat bag for Max when we go to the theatre. This normally includes some sweets and a drink. Nothing too noisy with wrappers. We go for some haribo or pop to the sweet shop. We also like to take a teddy or cushion for Max so he has something familiar with him. We do it less now that he is older, but we still stick to this routine when we are watching longer shows like musicals and pantomimes. Make it an experience they won't forget. Go all out and have dinner beforehand, put on some sparkly clothes. The theatre is a magical place where dreams and memories are made. It's a place to have fun and the Christmas season is the perfect time to take your little ones to a theatre to see what is on. We definitely can't wait for all of our trips this coming month!